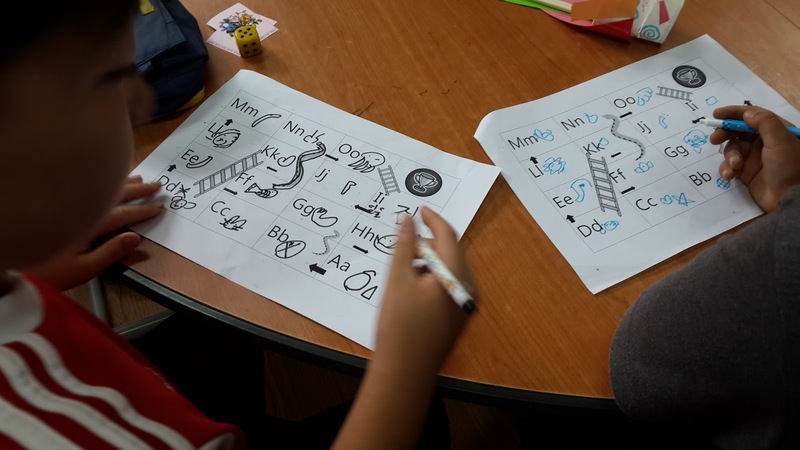 Grade 1 & 2 Alphabet Bingo & Snakes & Ladders! Free Stuff! So here is a lesson that worked. I made these two simple worksheets, one is a bingo game and the other is Snakes and Ladders. 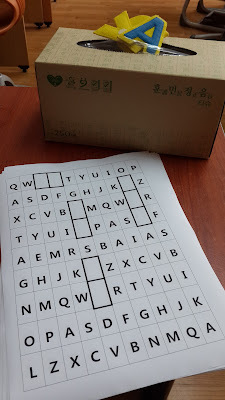 During my last class we played another form of alphabet bingo that worked really well, so I wanted to do something similar and this worked really well, also. I made these two worksheets and printed them for the kiddies, double sided. They were really excited to see the Snakes and Ladders template on the back, but we played the bingo first which they really enjoyed also. Here's worksheet one: (Just click on the image and then save it to your computer, copy and past in a Word Doc. Or you can download it, free here. Get the students to fill the blank boxes with whatever letter they like = this creates the bingo randomness. Tell them they need to get 6 letters in a row (horizontal, vertical, diagonal) to win bingo. I rewarded the winner a sticker. 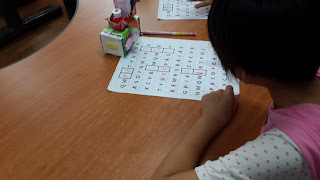 Now, the letters - to make it more random and fun, I put my felt alphabet letters inside an empty tissue box and the students each had a turn to pick one letter from the box and say it out loud. 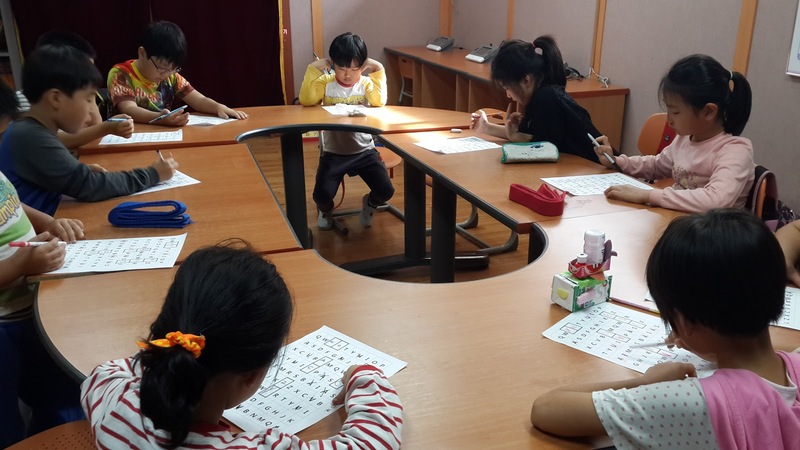 My grade 1 and 2 don't know the alphabet completely so this was good listening, reading and recognizing practice. They loved it. They loved the tissue box, the crossing of the letters and more. 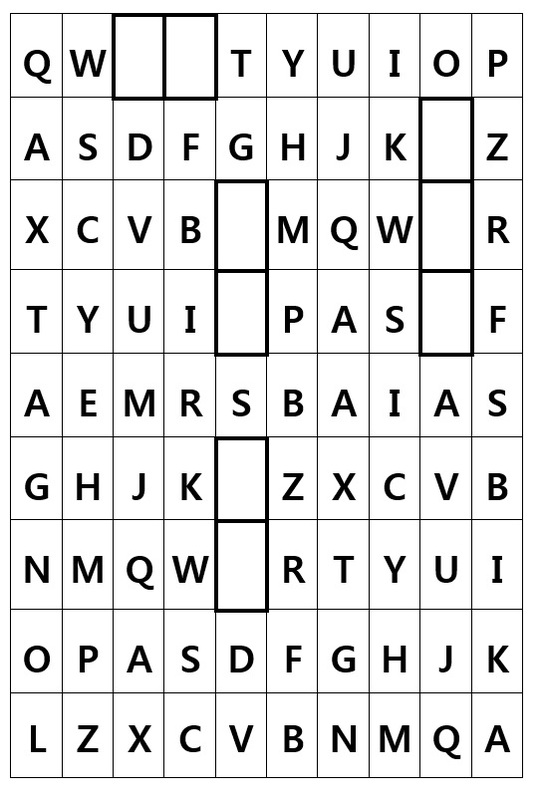 NOTE: In this bingo style game - when 1 letter is called out, they should cross or circle every time it repeats on the worksheet. So if 'X' comes up, the students should cross out every X that appears on the sheet - including their own X if they wrote that in the blank boxes. It's also good if you count how many should appear - and say something like "two X" and then you are practicing some English numbers as well as checking that they have found the write letters. They were keen to listen for this during the game and some would beat me to it and say aloud "four Q!" etc. 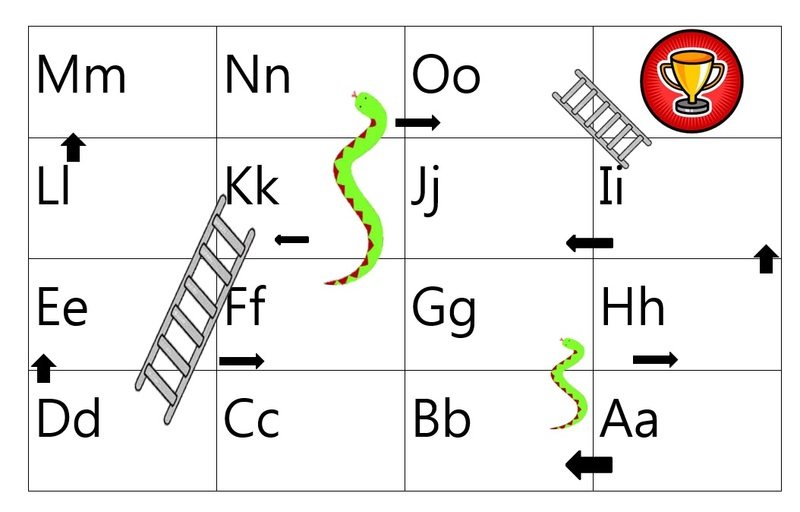 And here's the Snakes and Ladders - save image and paste it in a word doc or download it here. First, I like to play the Phonics song and then for each letter on the bingo sheet they should draw the object/animal that comes up in the song for each letter. E.g. They would draw an Apple next to A because the song lyric is "A is for Apple, Aa Aa Apple. B is for Ball, Ba Ba Ball..."
After the sheet is filled with their drawings then we played. For higher levels, you can give dice and they play in pairs. They can draw a shape like a circle, star or heart as their 'marker' - or give them little pebbles to be markers, etc. But for my low level Grade 1 and 2 we played as a class. And I figured, the winning student is whoever's turn it is to roll the dice, and if they land in the winning box - they are the winner. Again, they just circled or drew a shape to mark their place on the board. Messy, but fine. Also! TIP: When you need to make a board game like Snakes and Ladders longer, make it so you need the exact number to hit the winning box. For example. If you look at the worksheet below. Say, your marker is on the letter Mm. To make the game last longer I would say you need to roll a 3 to win. If you roll a 4, then you will hit the winning box but bounce out again and land on Oo. So if you don't get the exact dice roll needed to land in the winning box you bounce back out according to the number you rolled. Another example, say you're on Mm again - but you roll a 6. So you would move to Nn, Oo, Winning box then bounce out and move to Oo, Nn and then be back on Mm once again - that would be 6 boxes moved. So the winner I gave a sticker , and the entire class played as 1 team. 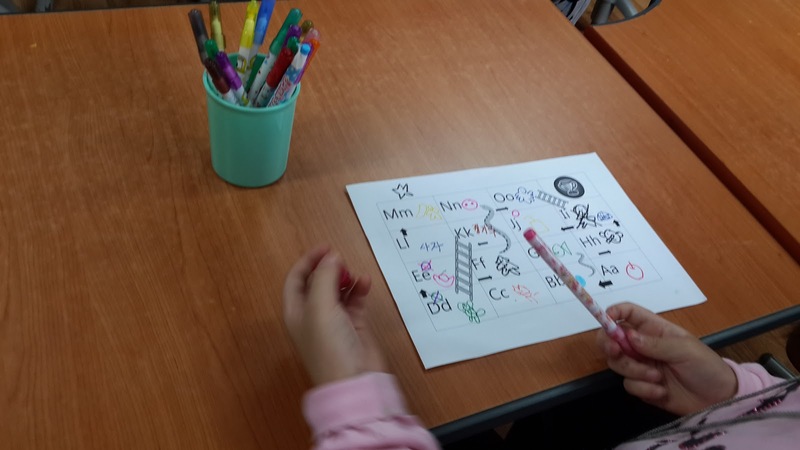 This worked well as they were all trying to roll the perfect number to win, so it was competitive and we would obviously recite the letters we landed on and sing a bit of the phonic song at each also. Hope these help you for your Grade 1 and 2!